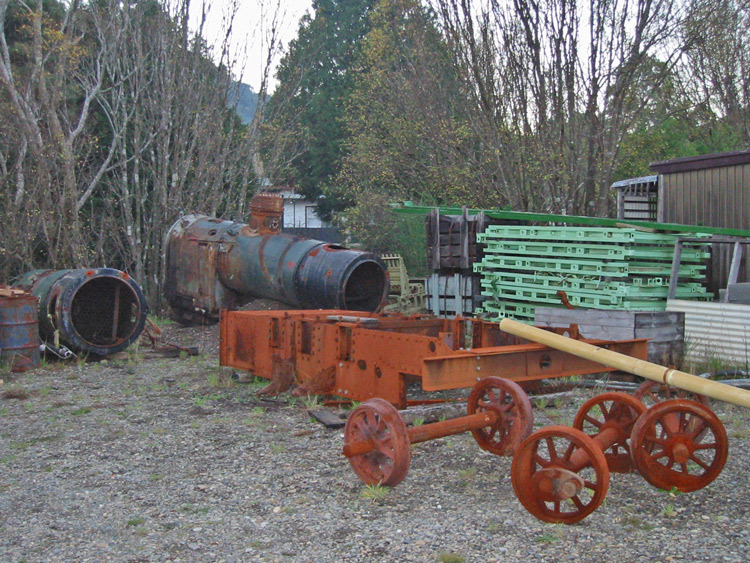 Orenstein & Koppel 4241's upper half sitting on a transport frame in the Abt Railway workshop yard at Queenstown. 5 May 2003. The Lake View & Star Gold Mines Pty Ltd operated a one-mile tramway for transporting gold ore from the Hannans Star Shaft to the Lake View Mill, with two 0-6-0T locomotives supplied by Orenstein & Koppel in 1910 (builder's number's 4241 & 4242). These locomotives were reduced to standby usage around 1938 following the arrival of two Planet Oil Engine locomotives. Both locomotives were later used by the Great Boulder Gold Mines. Orenstein & Koppel B/No. 4241 was out of service at the Great Boulder Mines by 1962 and was apparently sold to a scrap dealer in the Perth metropolitan area. Fortunately it survived into preservation and seems to have had a number of owners as it moved from location to location. 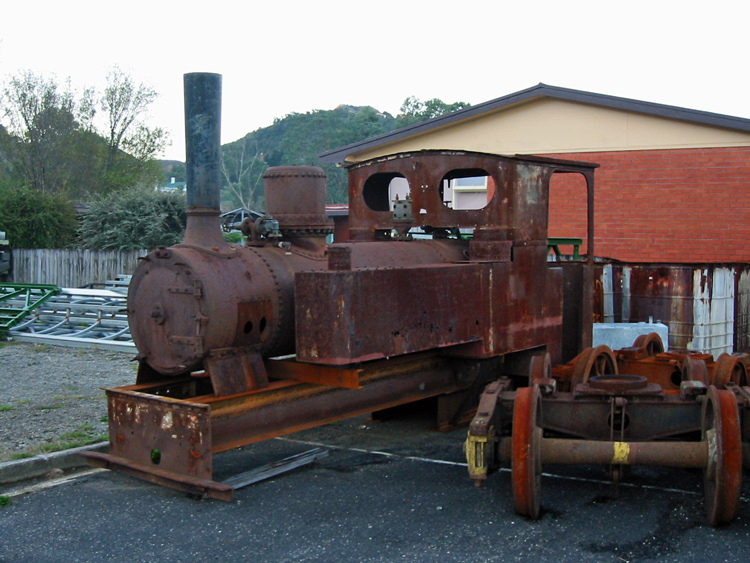 It was at the Marsden Museum of Historic Engines, Goulburn NSW from December 1973 to late 1976, when it moved to the Wodonga Woolshed, Victoria. According to this listing of Preserved Orenstein & Koppel Steam Locomotives it then moved to Bankstown NSW. Orenstein & Koppel B/N 4241 was transferred to the Queenstown workshops of the Abt Railway on Tasmania's west coast region in approximately 2000 and a start made on overhaul and regauging from 2' to 3' 6". Work appeared to be progressing slowly at the time of my visit of 5 May 2003; wider stretchers had been fitted to the frames and the driving wheels mounted on broader 3' 6" axles, however the various components were sitting stored in the workshop yard. I understand the gauge conversion was not completed. 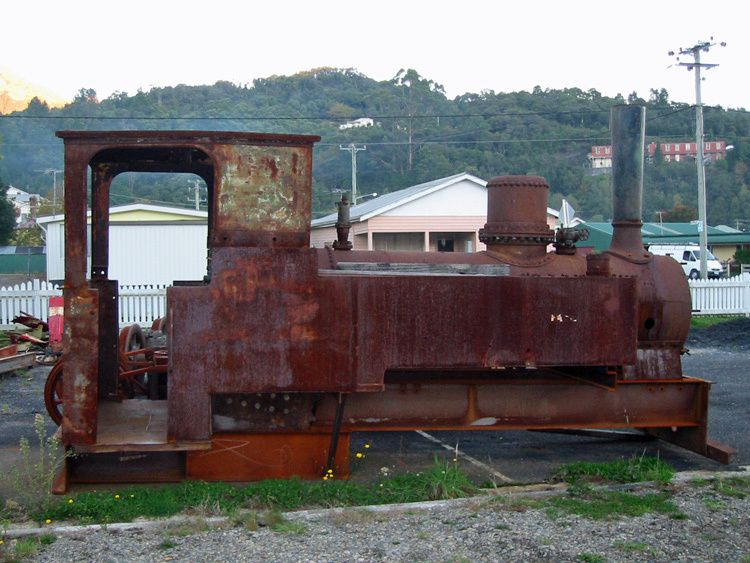 This locomotive has since been relocated to the Wee Georgie Wood Steam Railway at Tullah. Being a 2' gauge line, that would suggest conversion back to 2' gauge is now intended. Further information about the restoration of this locomotive and its current status is welcome. A second view of Orenstein & Koppel B/N. 4241 stored at Queenstown, taking in the fading evening light of 5 May 2003. The locomotive frame (upside-down) and wheelsets were stored nearby. The frame had been fitted with new stretchers for conversion to 3' 6" gauge operation. Similarly the wheels were on new, broader 3' 6" gauge axles. finding this builder's plate on the firebox backhead provided the answer! 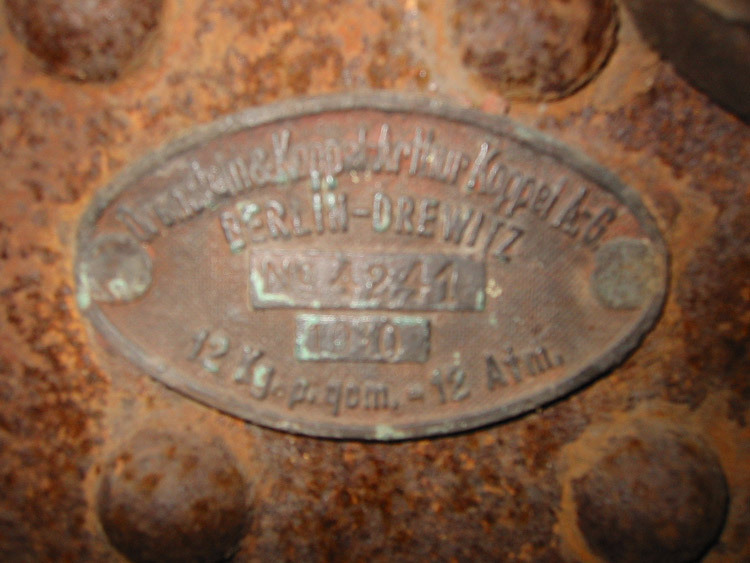 Alas I struggled to get a decent photo of the builder's plate detail. 'Light Railways - Australia's Magazine of Industrial & Narrow Gauge Railways', Number 69, July 1980. "Marsden Museum of Historic Engines - Goulburn Steam Museum" by Ken McCarthy.